The best Project Management Software can transform the way you run your business. Project management tools, such as Jira or Asana, can help you co-ordinate complex projects with ease and clarity. It’s a competitive field, with numerous Project management Software providers vying for the attention of digital businesses. So, it can help to understand the potential of each tool before choosing one for your own needs. In our Project Management Software reviews and advice guides, we help you to understand the best tools and options for businesses of any size, plus how to get the best out of this kind of software. Put simply, Project Management Software is a type of system that helps a business to plan small or large projects, co-ordinating tasks, actions and outcomes with multiple stakeholders. If you’ve ever found your business struggling to clarify outcomes from a busy team – who is responsible for what tasks and for what end result – then Project Management Software can help. You can use it to clarify responsibilities and tasks in a simple, effective manner. 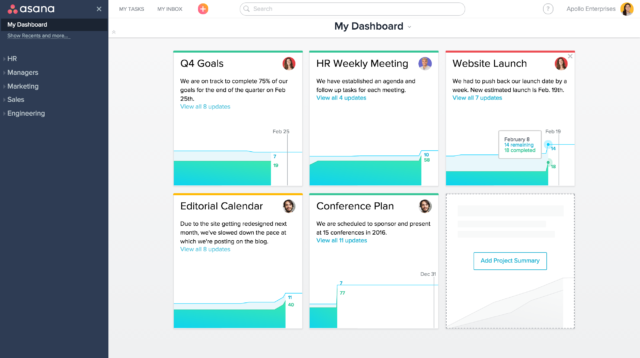 Asana is another huge name in Project Management Software, and well worth considering if you're looking to create efficient workflows within teams at your business. You can get going with Project Management Software for free. Popular tools such as Trello let you enjoy plenty of features without paying. But, for a larger team, you’ll want the superior features, reporting and depth of a paid-for Project Management tool. Costs may be per user, starting from less than $5 per user, per month; or, you can pay for an enterprise plan with unlimited users. The main benefits of Project Management Software are clarity and accountability for tasks and outcomes on a business project. Say you’re running a team of 10 people, each with different tasks contributing to a main project. Good Project Management Software will let you clarify who owns tasks, who needs to be kept aware of them, and what the key outcomes must be. All of this can link to the existing email and calendar tools your business is running, too, sending key notifications to stakeholders as progress is made. There are some big names in the Project Management Software space, each competing with tools that do similar things, in a slightly different fashion. Jira is one of the industry leaders here, trusted by digital teams worldwide for projects. 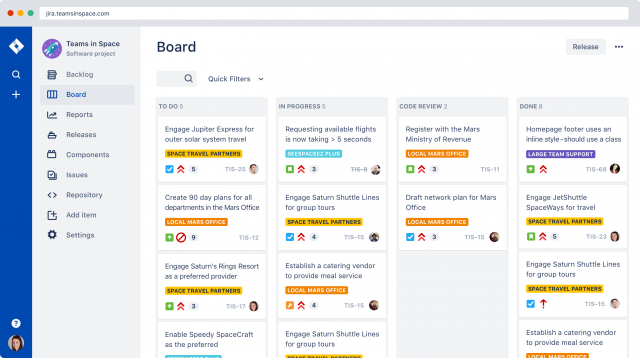 Asana and Wrike are also major Project management tools to consider, as is Trello. Before you choose, check out our no-nonsense Project Management Software reviews for an overview of the key benefits of each.